“M” is the symbol of a mysterious firm, Ming Inc, an internet giant in the mould of Google or Facebook, but on the Chinese side… These new Asian empires are called Baidu, Tencent and Alibaba, with the only difference that, in the words of Stanford professor Andrew Ng, a former Google and Baidu employee: “The Chinese know what Westerners are doing but not the other way round.” “M” is also a reference to Moira Chevalier, the heroine of the thriller – a brilliant young Frenchwoman recruited by Ming who discovers a terrifying world at the edge of the abyss… our world. Where did the idea to base your thriller in Hong Kong come from? We’re living at a time when everything, absolutely everything, is changing. And it’s in Asia that things are moving most rapidly. I could have based my mysterious, disturbing company, Ming Inc, in Shanghai or in Hong Kong. When I happened to be there last summer, one of the Chinese mobile phone giants was listed on the Hong Kong stock exchange. And then it’s a city that has always fascinated me and that is a fabulous backdrop for a thriller. It is the highest city in the world and one of the most densely populated, with more than 7,000 tower blocks. It is a perpetual maelstrom that is like an incredible ant’s nest or termite mound. It’s New York to the power of a thousand. A city that is largely run-down, chaotic and anarchic. I went there in the middle of the rainy season, which made everything even more dramatic and oppressive. It was like being in the first Blade Runner with Harrison Ford ! Hong Kong is the city of the future. A nightmare in many ways. Tell us about your heroine, Moira Chevalier. What role does she have at Ming? Yes, M, le bord de l’abîme is a thriller that talks about paranoia, manipulation, the impossibility of hiding in the modern world, the end of private life with the all-out development of Big Data and people becoming more and more technologically connected – above all, it deals with those huge, opaque internet companies that now pull all the strings and dictate the rules. Moira is right to be scared because, parallel to this, we have two Hong Kong cops – the honest young Chan, meticulous and almost ascetic, and the philosophical, corrupted older man, Elijah, who has seen it all – investigating a series of diabolically inventive and perverted murders committed by someone they christen “the black prince of pain.” The initial evidence leads them to think these terrible crimes could well be the work of a Ming employee… a monster that Moira might be frequenting daily without realising… And what is the role of DEUS, the intelligent vocal super-assistant with its all-too-human reactions, in all of this? 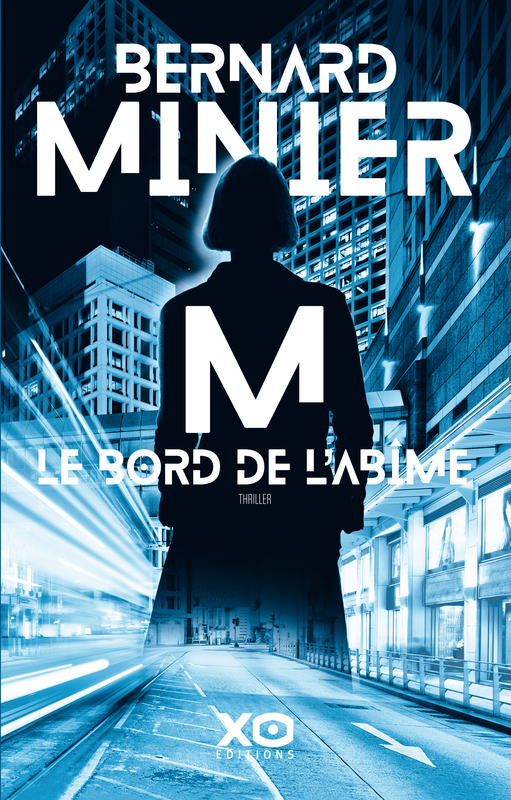 I want to emphasise that M, le bord de l’abîme is a contemporary thriller and above all not a work of science fiction. I am describing technology that is already part of – and will be increasingly – our everyday lives but which people do not know much about. M is a novel about today’s world. What interests me is the impact that artificial intelligence has – and will have – on our lives, our choices and decisions and how it’s going to turn our worlds upside down. It is disorientating, fascinating and terrifying… It also means that readers identify with and understand the characters, sharing their emotions, worries and struggles, because that world also concerns them. It concerns us all. This novel can help us understand what is happening and what is going to happen; I believe it gives a clear signpost to what awaits us. To achieve that, I had to undertake extensive research and investigation. As far as I know, it is one of the first works of fiction to address these questions that understandably preoccupy us. From that point of view, it is certainly my most ambitious book – and also a thriller that is very different from my others. In the book you seem rather pessimistic about the future of humanity. Are you principally worried about our personal freedom “at the edge of the abyss”, in the words of your title? It’s true that Moira Chevalier is the opposite of Martin Servaz – at least in the beginning… Servaz feels out of place in the contemporary world and its new technologies. Personally, I feel closer to him; I’ve known a world without mobiles and internet, a world that is easier to read and less complex than today’s one. But we need to be clear that we cannot escape from the world that is being created before our eyes. We cannot go back and undo what science has done. On a different subject, I have had a phone conversation with the dear commander and he tells me he is involved in a huge new case… It shouldn’t be long before we hear about him again.